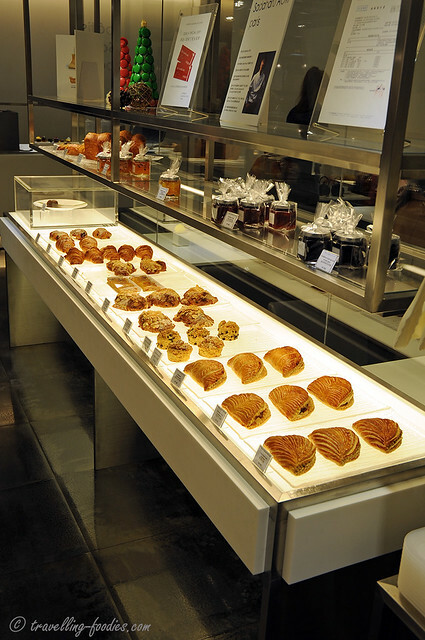 Selection of laminated pastries, i.e. croissants, danishes and chaussons which we’d never tried… we have sworn our allegiance to the cakes! Senseuille, one of Aoki’s latest creations. In Taipei, it is an “exclusive” to Formosa Regent boutique and not available at Bellavita. 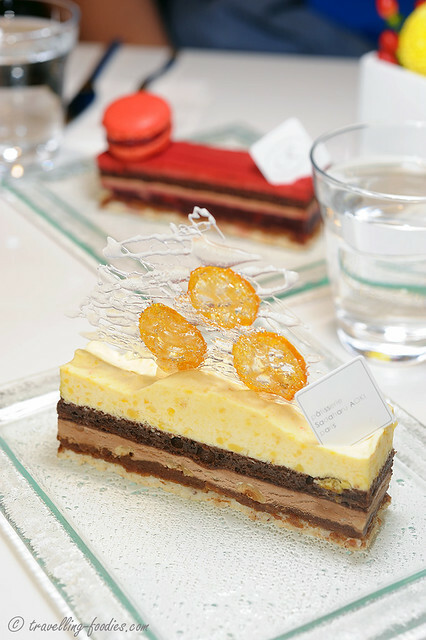 It is a 6-tier entremet with a dacquoise au noisette as the base layered with praline feuilletine au noisette above. 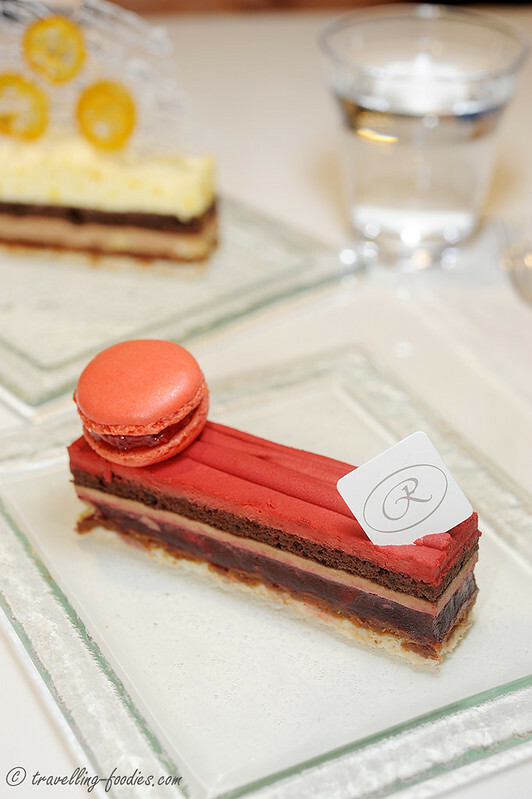 This is followed by a layer of gelée au framboise which had been curiously studded with more roasted hazelnuts, then mousse au chocolat au lait, a thin slab of biscuit joconde chocolat and finally mousse au chocolat au blanc tinted rouge. 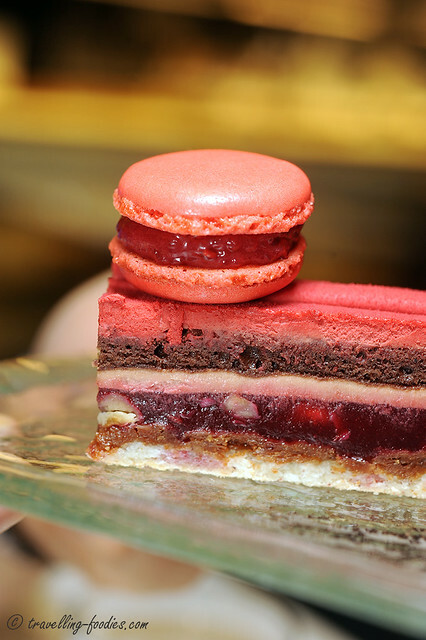 The piece is then crowned with a macaron à la framboise. Out of the six components in Senseuille, four are basically the same as his signature piece Valencia, i.e. dacquoise base with the crisp praline feuilletine above it, as well as the milk chocolate mousse and chocolate joconde sponge. The chocolate mousse is supposedly spiked with a liqueur d’orange… wait a minute, isn’t that in Valencia as well? 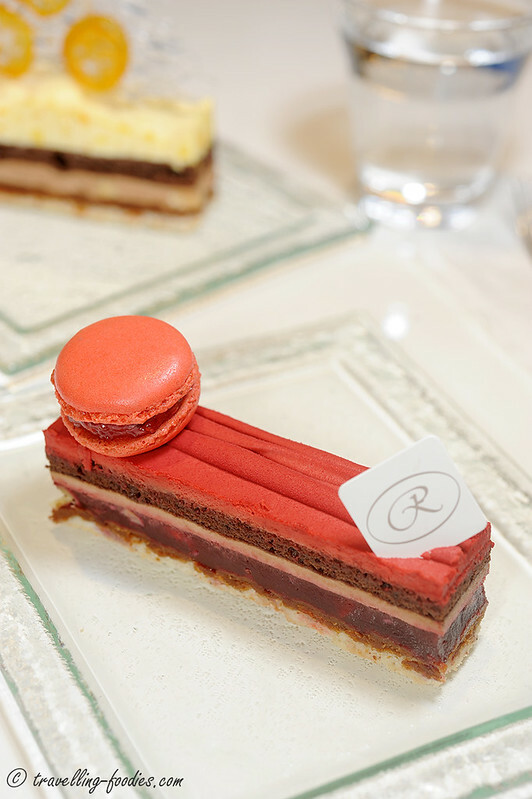 I love the tart flavours of raspberry in the gelee as well as the confiture filling of the macaron. Well, that is because I have always been partial towards raspberries to start with. Pastry works which incorporate the fruit are usually never boring. Well most of the time at least. But on the whole, the flavours are rather heavy handed for an Aoki piece. It is quite enjoyable on its own, i.e. the flavours worked reasonably well, with the rapsberry and chocolate complimenting each other. 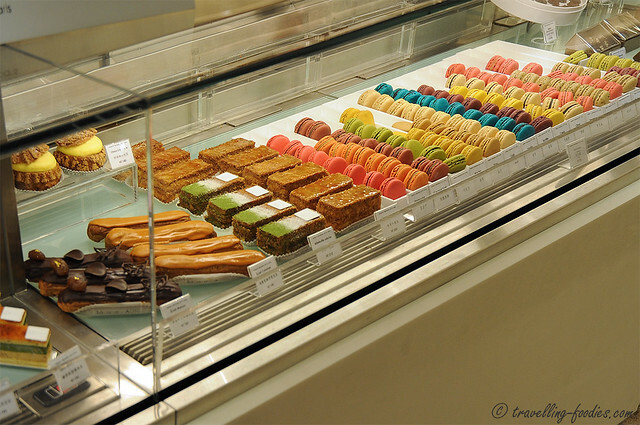 The macaron shells were also very well made. But that without comparison to other Aoki creations which preceded it. 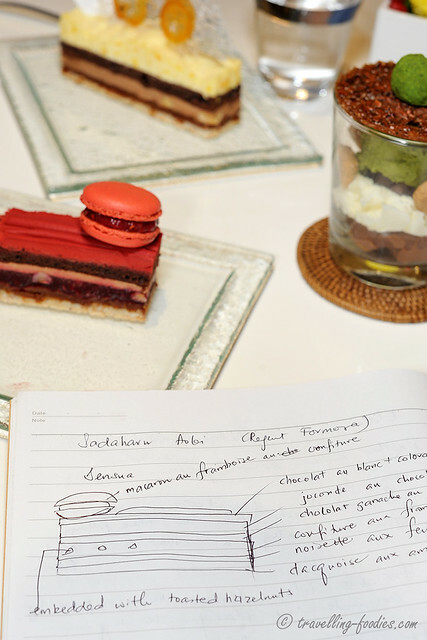 However, having sampled so many works by this Japanese-French pastry master, comparing is something which one couldn’t help do. I can’t help think that Senseuille is basically a recycling of components (and ideas) which he’d used before. Seemingly a simple game of mix and match and voila! I know I’d said this before on several occasions on this blog now but with no intentions to bore you, Valencia definitely runs high on my list of favorite Aoki items. Yes, they have been marked and ranked. Asthetically astounding with a really lovely flavour profile of citrusy tang against the smooth exuberance of chocolate, I can’t see why one wouldn’t like it. So we ordered it, knowing that J enjoys this piece as well but that proved to be a bad choice somewhat. As mentioned above, Valencia shared many similar components with the newest kid on the block, Senseuille. Admittedly, alternating our cake forks between the two pieces somewhat marred our ability to enjoy them maximally as two uniquely crafted works. Well. that said, Senseuille is not altogether that unique. But the fault is entirely mine as I should really have inquired about the components with the maître d’ before ordering. We added “Verrine Bamboo” to break the monotony, which turned out to be quite enjoyable. This gelato creation is fashioned after another Aoki’s signature “Bamboo“. 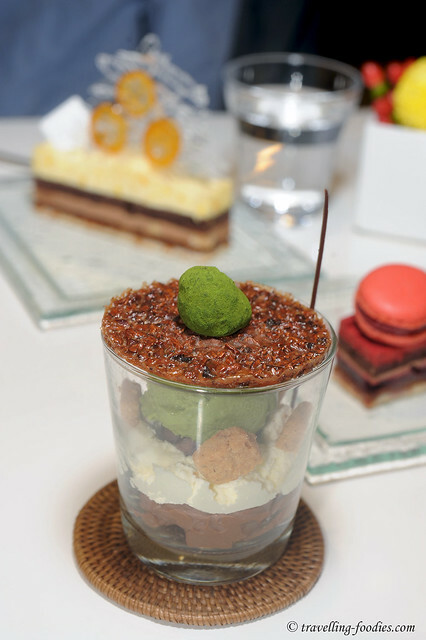 From the bottom, the composition consists of creme au chocolat, creme chantilly with bits of crumble and azuki beans on it, glace au thé vert matcha, tuille cacao and a matcha truffle. Simple composition but nonetheless very delicious. The components were all exquisitely made on their own. Single scoop of green tea gelato was refreshing with a very apparent taste of the matcha unlike some watered down versions elswhere. The crisp textures of the tuile and crumble bits was excellent contrast against the velvety chocolate mousse and creme chantilly. And they were very very buttery aromatic too! A look at some other stuff available at Aoki’s. Til we meet again in a couple of weeks’ time! 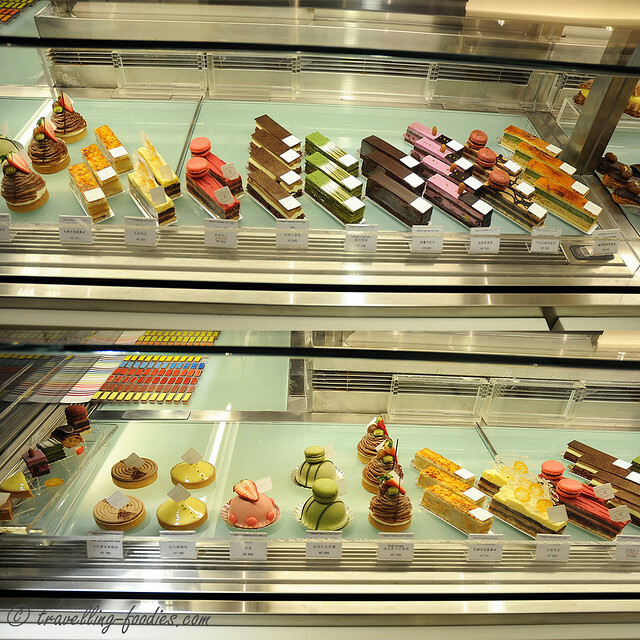 This entry was posted on May 3, 2013 by Alan (travellingfoodies). 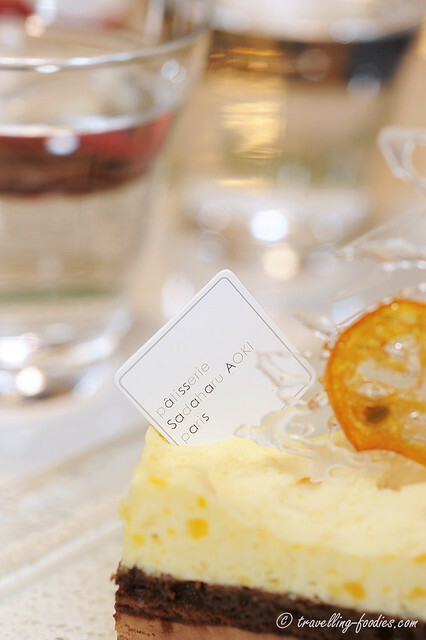 It was filed under Food, Travel and was tagged with 点心, 甜点, 蛋糕, 青木定治, 马卡龙, macaron, patisserie sadaharu AOKI, sadaharu aoki, Senseuille, Taiwan, Valencia, Verrine Bamboo, 台北， 法式烘焙, 台湾.